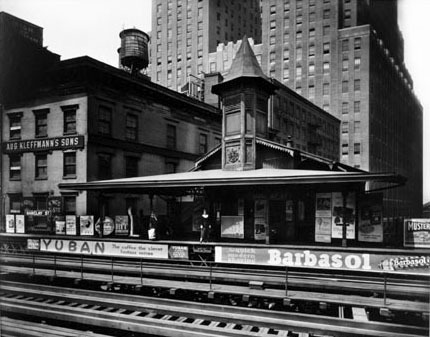 Primarily known for her systematic and richly detailed photographs of New York architecture, Berenice Abbott believed in the photographer’s responsibility to represent truth and the realities of life. For her series, Changing New York, (1935-1939), Abbott resolved to create an all-encompassing body of work documenting the city’s many sides. The project, funded by the Works Progress Administration’s Federal Art Project, culminated into an abstracted, often graphic, representation of a city on the brink of revolutionary change. Images of Modern skyscrapers are juxtaposed with the makeshift shelters constructed by the homeless in Central Park; for every beautiful example of architecture, there is another of human destitution. Abbott is less well-known for her photographs created for physics textbooks and Science Illustrated magazine, which illustrate complicated scientific principles. For her image, Beams of Light Through Glass, she illustrates how glass splits light into separate wavelength by placing two glass triangles atop one another with water in between and completely sealed from air. 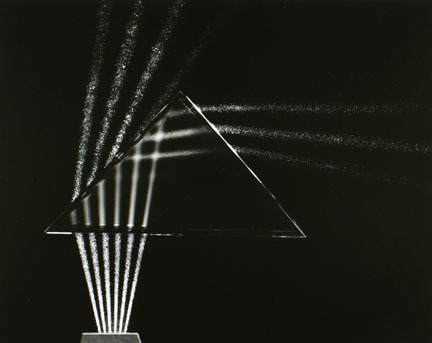 Six laser beams illuminate from below, demonstrating light transforming, bending, and refracting depending on its intersection with air, water, or glass. For Cycloid, she attaches two lights to a rolling ball: one on the edge and one in the center. While rolling the ball across a tabletop, Abbott holds the exposure on her camera, tracking the movement of the ball and light to depict basic principles of physics. The pictures ponder the role of light in photography and in life from a purely scientific perspective and provoke questions on the camera’s primary function as a tool that uses light to document the world. Born in 1898 in Springfield, Ohio, Berenice Abbott traveled to Paris in 1918 with the intention of becoming a sculptor. Instead, she became Man Ray’s photographic assistant and by 1925 was a professional portrait photographer in her own right. 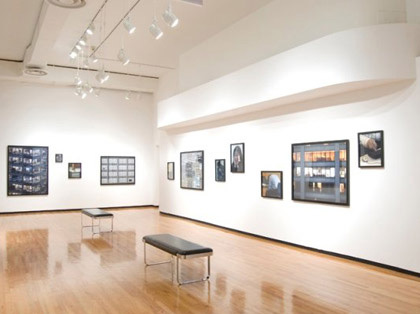 Known for her systematic and richly detailed photographs of New York, Abbott also photographed scientific subjects for Life and for three secondary school physics textbooks. Abbott founded the photography program at The New School for Social Research (where she taught for over twenty years), was a prolific writer, and held four US patents for photographic and other devices. By purchasing Eugène Atget’s archive and essentially functioning as its curator until its sale to The Museum of Modern Art, New York, in 1968, Abbot can also be credited with preserving this important body of work. She died in 1991.